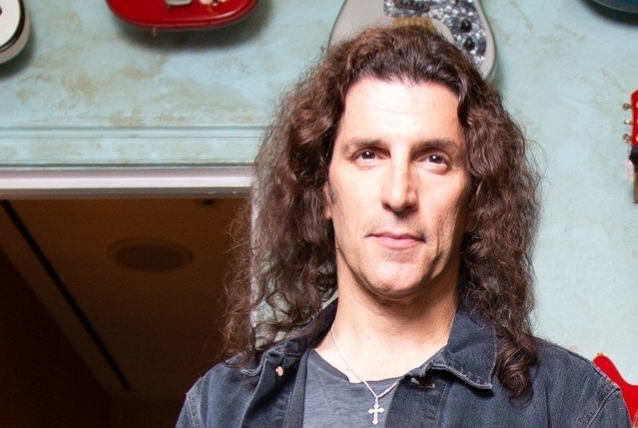 Share the post "ANTHRAX’s FRANK BELLO Has Begun Writing His Memoir"
ANTHRAX bassist Frank Bello has commenced work on his memoir. The book, which does not yet have a release date, is being written with Joel McIver, the bestselling author of more than two dozen books on rock music, including “My Life With Deth” from Bello‘s ALTITUDES & ATTITUDE bandmate, MEGADETH bassist David Ellefson. Bello is not the first member of ANTHRAX to write an autobiography. Back in October 2014, ANTHRAX guitarist Scott Ian released “I’m The Man: The Story Of That Guy From Anthrax” via Da Capo Press, a member of the Perseus Books Group. For “I’m The Man”, Ian worked with Jon Wiederhorn, co-author of the books “Louder Than Hell: The Definitive Oral History Of Metal” and “Ministry: The Lost Gospels According To Al Jourgensen”. ANTHRAX is hard at work on material for the follow-up to 2016’s “For All Kings” album, tentatively due in 2020. When not writing new music, the band is continuing to tour in support of “For All Kings”, which was called by some critics ANTHRAX‘s strongest album to date. Its arrival followed a five-year period during which the band experienced a rebirth of sorts, beginning with ANTHRAX‘s inclusion on the 2010 “Big Four” tour with METALLICA, SLAYER and MEGADETH, and continuing with the 2011 release of comeback LP “Worship Music”.